Are you ever bored by action sequences? I am. 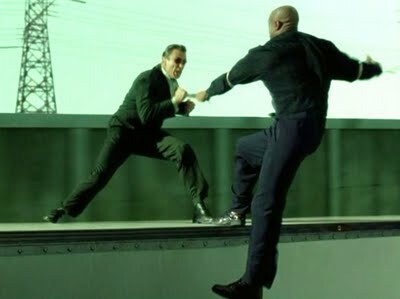 As much as I love action movies, dig a good scrap between hero and villain, and adore edge-of-your-seat stunts, I often find myself bored or underwhelmed by very technically advanced and well choreographed action in movies and, indeed, in books and comics as well. Where one film can blow twenty million dollars on some special effects extravaganza involving two guys wrestling on top of a moving plane in the middle of a dogfight and fall utterly flat, another movie can have a simple brawl in a bar that takes my breath away. So, what’s the difference? Well, quite simply it boils down to emotional investment in the stakes involved. The same rules that make good musicals can and should make good action movies. Sound crazy? Well, consider this: when do characters sing in a good musical? Well, they usually do it at a crucial juncture in their story–when they are trying to make a decision, expressing their emotions, or are at a point where they can’t do anything other than sing to resolve the tension or advance the conflict. Fights and action sequences should basically work the same way. A hero should get into a fight when the stakes are too high to do anything else–they are at a crossroads, with an obvious choice to make, and we are invested in that choice as it is an important part of the story. The best action and adventure movies understand this implicitly. Take, for example, Raiders of the Lost Ark, which features many of the best action sequences in movie history–every single one of them involves high emotional stakes for Indy, for the audience, and are necessary for the plot to advance. Each sequence adds to the film, rather than wastes our time by putting the ‘real’ story on pause. HOLY CRAP! They're jumping *and* shooting guns! For a good example of how to both do this right and do it wrong, we need look no further than the Matrix movies. The first film was fantastic–the stakes were clear, we were invested in the outcome of the fights, and they served to advance the story. 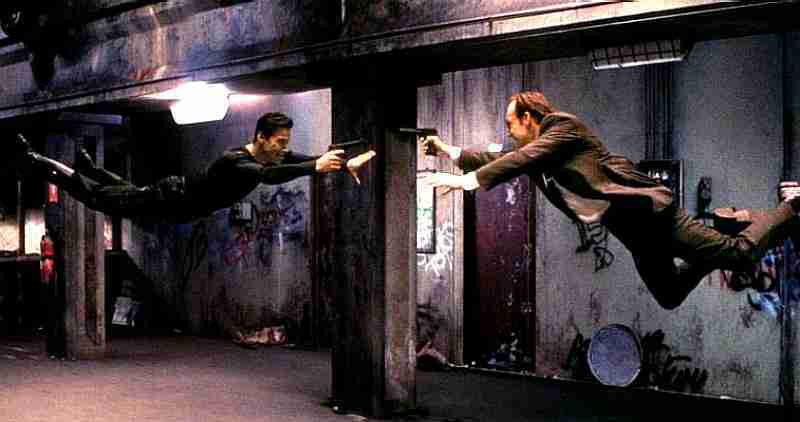 The fight between Neo and Agent Smith in the subway station is cathartic; it is the culmination of the plot, and we hang on every blow. We feel as though Neo’s life is in legitimate danger (even though we know it probably isn’t through simple plot calculus), and when he escapes agaisnt all odds, we cheer for joy. It works because it fits with the story, not outside or around it. It’s part of why we’re there. WTF is going on, here? Why are we on a truck? Who is that guy? What do they all want? Now, let us consider The Matrix Reloaded. Now, I don’t think the essential storyline of the film was bad (John Kenneth Muir writes this review that explains why better than I ever could), but the action sequences were objectively terrible. Think back to that never-ending highway fight. Remember it? Do you remember what that was all about? Yeah, neither do I. I didn’t know when I saw it, either. I remember vaguely they were trying to catch something, but I forgot what during the scene. Oh, right–they were trying to get that keymaster guy, I think. Hell, I don’t know. All I do know is that the scene went on for a really, really long time and must have spent a lot of money for me to be checking my watch halfway through. It’s purpose wasn’t clear, if indeed it had one, and we weren’t invested in the stakes. Snore. A lot of adventure books, movies, shows, and so-on live by the mantra that the next fight needs to be bigger than the last. Budgets get larger, stakes get higher, and CGI effects multiply like mosquitos in a Louisiana swamp. The funny thing is, though, that bigger doesn’t automatically mean better. Better means better, and what makes something better is high stakes, yeah, but stakes that we identify with, care about, and understand. If the fight doesn’t do that, then what’s the big deal? They may as well sing, for all I’ll care. Posted on December 15, 2011, in Critiques, Theories, and Random Thoughts and tagged action, action sequences, fights, John Kenneth Muir, movies, Raiders of the Lost Ark, The Matrix, The Matrix Reloaded, writing. Bookmark the permalink. 2 Comments.